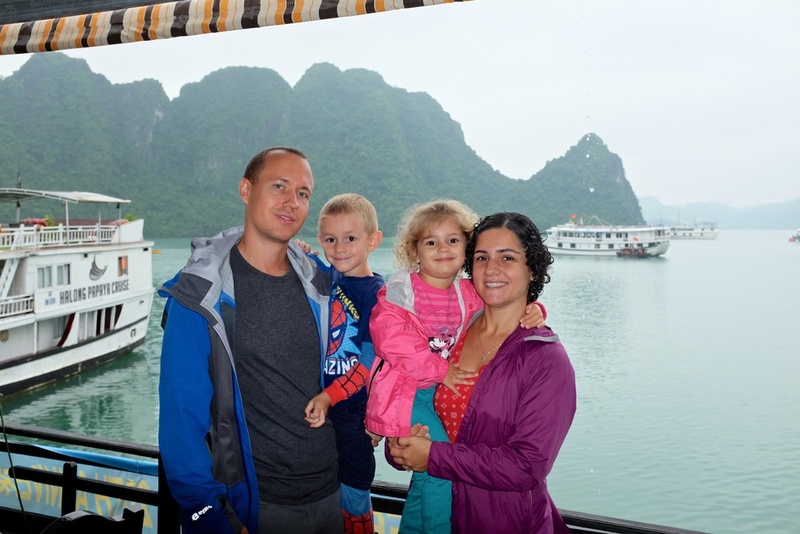 Today is the second day of our Halong Bay cruise (if you haven't seen the post for day one yet, check it out first). We were supposed to go kayaking yesterday afternoon, but in this season with the short days there just wasn't time for it, so it was pushed off until early this morning. Wake up call at 6 AM to go kayaking? Oh no thank you! I love kayaking, but the kids are too young for it, and I love sleeping much more, especially at 6 AM when my kids are totally passed out! When you become a parent, you appreciate your sleep a lot more. Besides, I am a night owl much more than I am an early bird! I can happily stay up until 2 or 3 AM, but unless I have some real motivation (like going to a Bar Method class or you know having to catch that train to work) I will be grumpy if you ask me to wake up before 7 AM. So we skipped the kayaking and joined the rest of the crew for breakfast a whole hour later, at 7 AM. 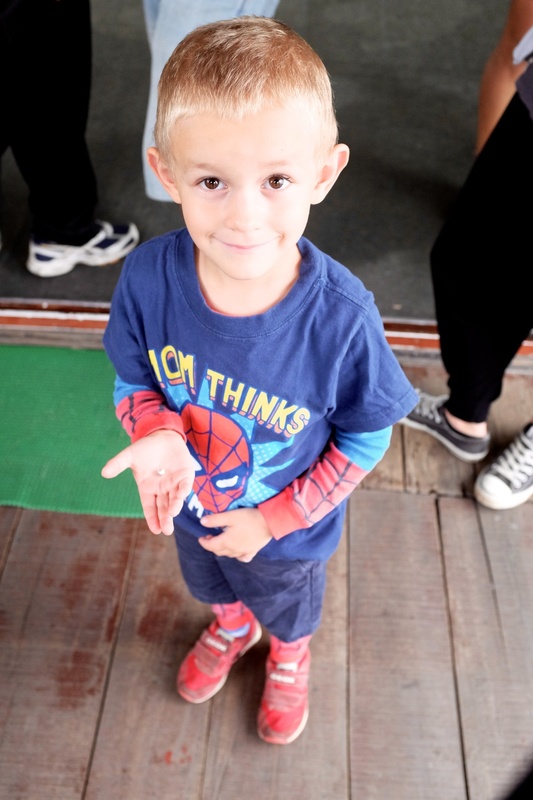 Shortly after, we arrived at the pearl farm. 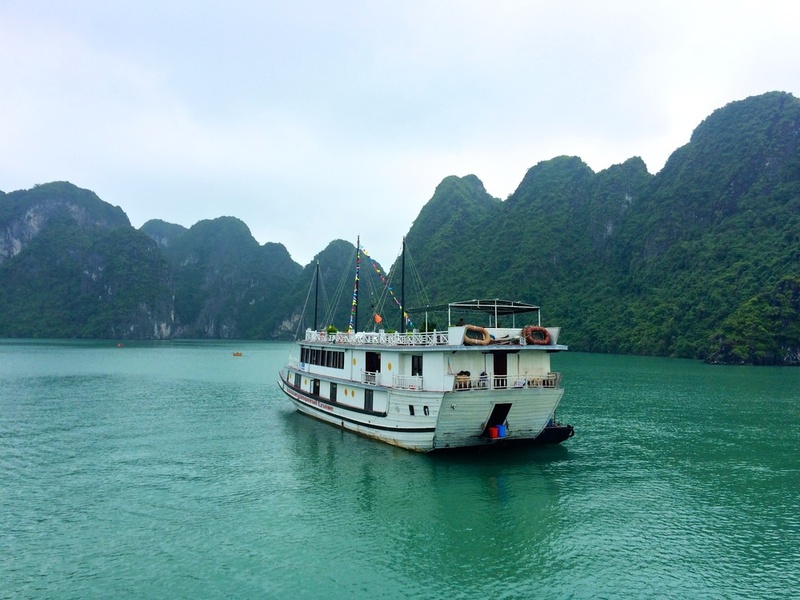 The pearl farm is on a "floating island", and it actually is designed more for tourists as a demonstration center than anything else. 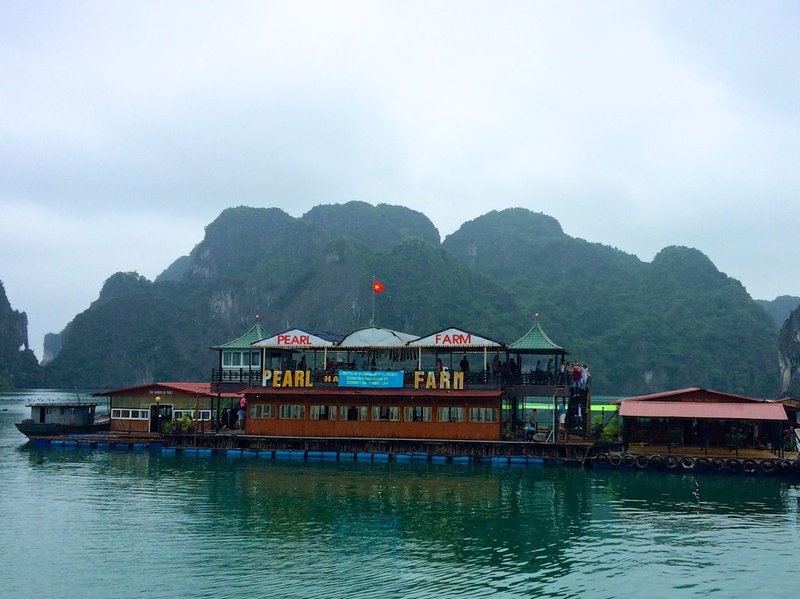 The actual pearl farms are about 10 KM from Halong Bay's Harbor. 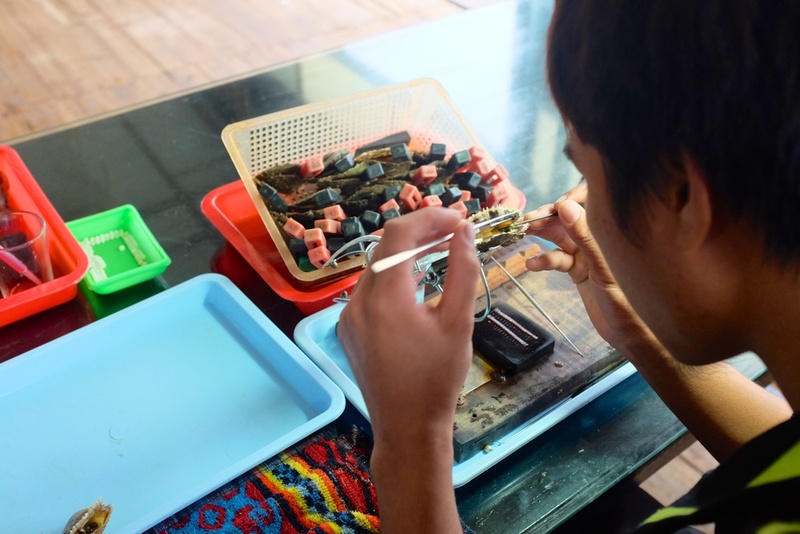 We were told by our guide that at this pearl farm a "nuclear pearl" (which is created by filing special imported oyster shells into small round balls) is "surgically" inserted inside a baby oyster, about 5 months old. The baby oyster then provides the right kind of environment for the pearl to grow. I didn't quite catch how long the pearl needs to remain inside the oyster, but at some point the oysters are taken out and the pearls are harvested. We were told that the people in Vietnam do not eat these oysters, and umm...they didn't look remotely appetizing. We walked through a pearl shop (again created for the tourists to purchase something) and the pearls are quite pricey! 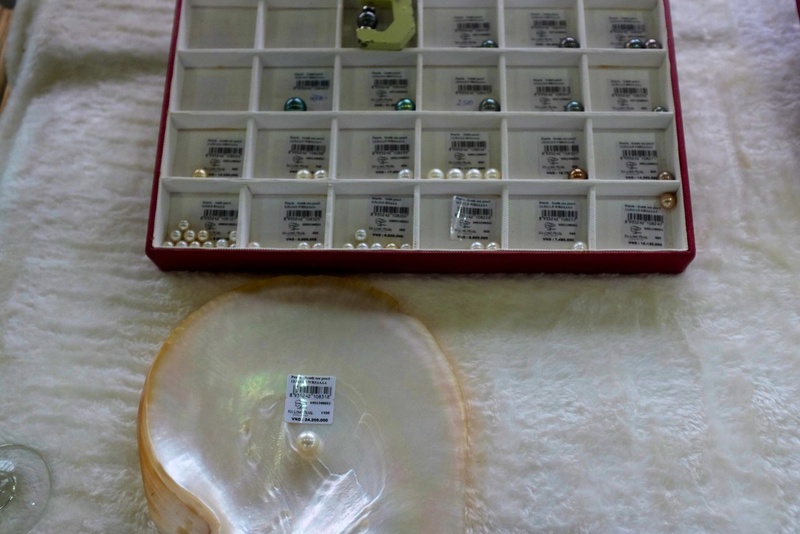 The pearl you see in the shell in the picture on the left costs over $1,000! Since we had no business in the pearl shop, we had fun taking a few pictures outside on the deck as everyone got ready to embark the cruise boat again. 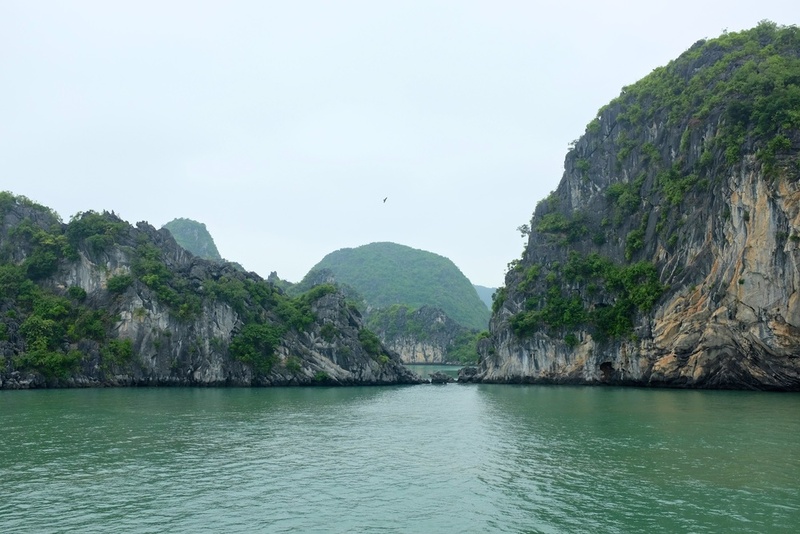 Sometimes pictures don't do amazing landscapes justice, which is why we put together this short video clip, hoping to give you a better idea of how beautiful Halong Bay is. 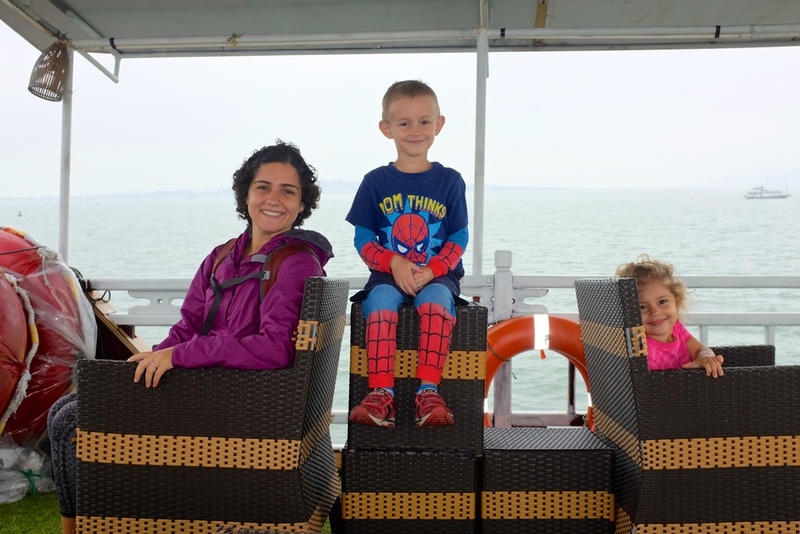 The journey back to the harbor took a while, but the kids had fun playing on the sun deck and we enjoyed chatting with some of our tour mates! There were people from Spain, Australia, India, England, China, Korea....Yep, seriously from all over the world. Back at the harbor we had a yummy lunch at a restaurant before hopping back on the bus. This time we got proper seats, and about 4 hours later were back at the apartment. What a great trip! So glad we decided to go. Only thing missing on the boat was some delicious dessert or a few small snacks, as it was a long time between breakfast and lunch. Otherwise, everything was marvelous.